When the cold winds blow, here in the North Country our thoughts turn to comfort food. Nothing takes the chill off like sitting down to a nice, warm meal fresh from the oven. Comfort foods, though, can seem like a lot of prep work. Peeling and cutting veggies, cooking up roasts and chickens, rolling out biscuits and pie crusts… not exactly what you want to do after a long day at work. Well, comfort food doesn’t have to be time consuming to be delicious, as we’ve discovered with this simple pot pie recipe from Campbell’s. 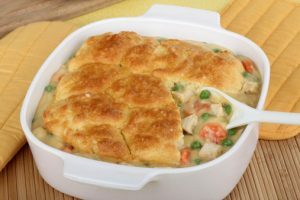 With just a few ingredients that you can easily find at Charlie Johns, you’ll be able to whip up this chicken pot pie in a jiffy! Heat oven to 400ºF. Stir together the soup, ½ cup milk, vegetables and cubed chicken in a 9” pie plate. In a small bowl, stir together the remaining milk, baking mix and egg. Spread this batter over the mixture in the pie plate. We like this recipe because it’s not only easy and delicious, but it’s also kid-friendly and easy on the budget. Visit Charlie Johns today and get all the ingredients to make this dish for your family tonight!